Wild Love Preserve was founded in April 2010 by contemporary visual artist and photographer, Andrea Maki. Most said it would be impossible to bring stakeholders together. Some went as far as to try and shut her down. However, she is built of tenacity, and is insistent on truth and integrity, and wouldn't allow others to derail her efforts to establish a new collaborative platform in the name of saving the Challis wild horses on their home turf, and wild horses in the West. The focus of Andrea and her organization, Wild Love Preserve, has been in bringing people together in a new light to collectively develop and implement new working solutions which serve to benefit wild horses and the whole. Fluid communications, mutual respect, listening and patience are cornerstone to establishing common ground. Watch Outdoor Idaho's feature about Wild Love Preserve from October 2017: "Wild Horses"
As result of a purposeful encounter combined with our nation's wild horse crisis, Andrea Maki's creation of Wild Love Preserve is intended as an interactive approach to protecting and preserving our iconic wild mustangs in their native habitat. Born in Seattle in 1966, Maki graduated from New York University on the Dean's List in 1988 with a Bachelor of Science Degree in Painting. In 1989 she returned to the Northwest where she still resides. Her contemporary art career spans 28 years, exhibiting and in collections nationally, including the National Museum of Women in the Arts. Maki's work reflects our universal energy and her deep connection with the animal world. Her mixed media work and photographs have time and again acted as means to spread awareness in relation to saving our environment and wildlife since the early 80's. Her 2002 invitational travels to the Arctic National Wildlife Refuge with author Peter Matthiessen and a small group, resulted in her project, "Spirit of the Arctic/Spirit of One", to promote awareness and support for this sacred place as means of giving back. In 2005 she created "The Wild Horse Project", following her 1999 wild horse series, also to promote support and awareness. Wild Love Preserve is a legacy project which speaks to our whole and reflects our humanity - past, present and future. Kindness, mutual respect, science and education are paramount. In addition to saving wild lives in a lasting manner, Wild Love Preserve has saved American taxpayers $7.5 million dollars since 2013 as result of our programs on and off the range. At a savings of $50,000 per lifetime for each wild horse adopted from the government system, the 2012-13 WLP Adoption Project alone, has saved taxpayers $6.5 million with our 130 rescued Challis, Idaho wild horses, while instrumental collaborative work on the range has saved over $1million federal dollars since 2014. With your help we will save more wild lives and taxpayer dollars in 2016. Enjoy WLP videos for wild lives we save and serve. “I am a staunch advocate for integrity, kindness, compassion and action on behalf of our greater good. Animals have always been integral to my life and being, the health of the environment equally paramount. 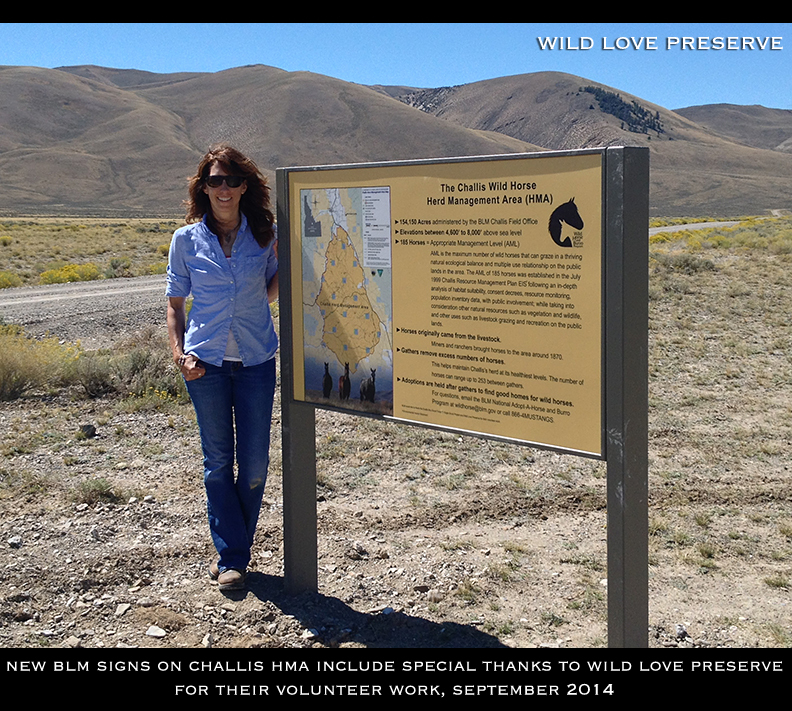 In 2010 I made a wild promise, which resulted in the formation of non-profit Wild Love Preserve. Little did I know at that time, the layered magnitude of this specific regional playing field for which I had just entered, and the array of stakeholders locked in opposition. Wild Love Preserve has grown to a scale I did not originally anticipate, organically evolving into a new multi-dimensional management model simply by way of responding to the multitude of logistics unfolding at every turn. Challenges plentiful, perseverance and patience required. WLP is about finding solutions and new ways of bringing people together. If you go in looking for a fight, you’re going to get a fight. If you approach with respect, kindness, patience and sincere interest in listening to differing perspectives, you can find common ground and open news doors to change. We can rise above drawn lines if we so choose.